There are many publications stating that ST elevation in lead aVR, with diffuse ST depression elsewhere, is due to left main (LM) occlusion. This is even stated in the lastest 2013 ACC/AHA STEMI guidelines (O’Gara PT et al. JACC 61(4):e83; January 29, 2013). However, the guidelines use as evidence an article by Jong et al. (Int Ht J 2006; 47(1):13-20). That article misleadingly defines "occlusion" as any stenosis greater than 50%, when it should rather be defined as 100%, or nearly so. All of the articles that claim ST elevation in aVR is a sign of LM occlusion confuse LM occlusion with LM insufficiency. In reality, ischemic ST elevation in aVR occurs in two broad categories: 1) in patients with recognized STEMI (due to coronary occlusion, usually of the LAD) and is associated with higher mortality than in patients without STE in aVR and 2) in patients without ischemic ST elevation, in which case there is always diffuse ST depression of subendocardial ischemia (which can be due to supply-demand mismatch or due to ACS). If due to ACS, this STE in aVR is associated not only with acute LM insufficiency, but alternatively with 3 vessel disease, or with LAD insufficiency. More recently, Knotts et al. found that only 23% of patients with the aVR STE pattern had any LM disease (fewer if defined as ≥ 50% stenosis). Only 28% of patients had ACS of any vessel, and, of those patients, the LM was the culprit in just 49% (14% of all cases). It was a baseline finding in 62% of patients, usually due to LVH. There is diffuse ST depression, with ST elevation in aVR. This is diffuse subendocardial ischemia. The ST elevation in aVR is reciprocal to the ST depression vector that is directed anterior, lateral, and inferior (towards leads II and V5). STE in aVR is thus reciprocal ST Elevation! There is a very tight stenosis that limits the blood flow, but there is clearly flow in all the arteries supplied by the left main. This limitation causes subendocardial ischemia with ST depression, but not transmural ischemia with ST elevation. It is not left main occlusion. The subendocardium is more susceptible to ischemia than the epicardium due to its proximity to the high pressure LV chamber and also because of its distance from the epicardial coronary arteries (the arteries that penetrate to the endocardium must travel a longer distance and go through the high pressure myocardium to the high pressure endocardium). Of course, this is a very dangerous situation: the myocardium is ischemic, and if it is due to thrombus (due to ACS), then the thrombus can and often does propagate to occlude the entire artery and then result in STEMI. Must you activate the cath lab? Rokos et al. 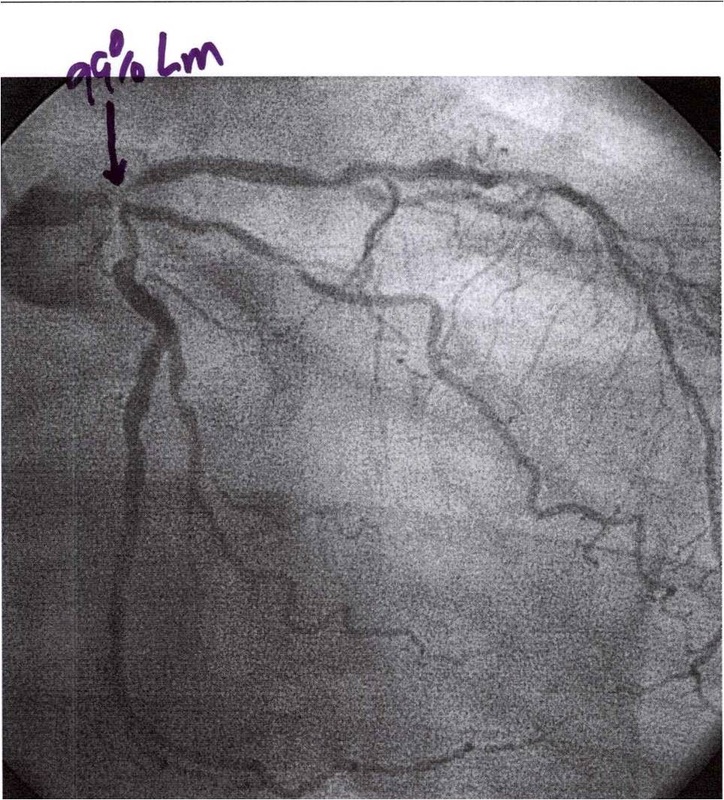 call this a "STEMI-equivalent" and suggest that the patient should go immediately to the cath lab (Rokos IC et al. Catheterization and Cardiovasc Interventions 79:1092-1098; 2012). However, in the data they present in this paper, there were 11 patients with true left main occlusion; 5 of them had ST elevation in lead aVR. But if one must read the fine print to realize that all 11 patients with the left main as the culprit vessel were enrolled in the study based upon the standard STEMI criteria on index ECG: 8 anterior, 1 inferior, 1 LBBB, and 1 without an ECG submitted to the core laboratory. In other words, these were STEMI that were already diagnosed as STEMI who also had ST elevation in lead aVR; one did not need lead aVR in order to make the diagnosis of STEMI. The conundrum arises when there is STE in aVR and ST depression in many other leads, and thus it is not a classic STEMI. Is this situation a STEMI-equivalent? As explained above, such ST depression with STE in aVR signifies diffuse subendocardial ischemia and is just as common in Non-ACS etiologies of ischemia (supply-demand mismatch) as in ACS etiologies. This is common in patients with GI bleed, sepsis, respiratory failure, severe anemia, tachydysrhythmias, severe hypertension, shock, and more. Diffuse ST depression with STE in aVR. It all resolved after hyperbaric therapy. There was no ACS. Cath lab activation should only be done for ACS. For non-ACS etiologies of diffuse ST depression, treat the underlying illness! 1) Did ACS initiate the ischemia, which then resulted in cardiogenic shock, which then resulted in pulmonary edema with hypoxia, respiratory failure, and tachycardia? 2) Or was the inciting factor bleeding, hypoxia, or severe hypertension with pulmonary edema and subsequent ischemia? This requires careful patient evaluation of volume status, laboratory values, presence of pulmonary edema and of course much more. One must evaluate the patient, with help from the ECG. The patient who has ST elevation in lead aVR that is not due to ACS will have appropriate treatment delayed and will undergo harm with cath lab activation. Furthermore, as stated above, even if STE in aVR with diffuse ST depression is indeed due to ACS, it implies open arteries, not occluded ones. There are institutions in which cath lab activation is a major use of resources, and if cath lab activation at night is not absolutely necessary, then it may be okay to avoid it. When there is diffuse subendocardial ischemia (which may or may not be left main insufficiency, but could also be LAD insufficiency, or 3 vessel insufficiency), it is reasonable to treat medically with nitroglycerine, aspirin, antithrombotics, and dual or triple antiplatelet therapy, and to re-assess. Often, the thrombus will cool off and the chest pain and ECG findings will resolve. If the symptoms resolve and the ST depression greatly improves, then the patient can wait for the morning to go to the cath lab as long as there is very close monitoring, preferably with continues 12-lead ST segment monitoring. Ischemia due to ACS that is refractory to medical therapy (persistent symptoms or persistent ECG findings) requires emergent cath. The majority of 100% left main occlusions do not make it alive to the ED, or arrive in arrest. At cath, only 0.19% - 1.3% of STEMI patients have LMCA occlusion (or 0.42% - 3% of anterior STEMI). I have used lead II across the bottom to find the end of the QRS, then drawn a ling upward to find the end of the QRS in all other leads. This helps to find the beginning of the ST segment. This ECG is typical of a patient with left main OCCLUSION. In fact, it was not exactly LM occlusion, but rather simultaneous LAD and Circumflex occlusion, which is in effect the same problem. --The rhythm again is difficult. There appear to be non-conducted P-waves. It may be supraventricular or nodal, or it could be idioventricular. --There is a wide complex. If supraventricular, this is RBBB + LAFB (often seen in massive MI). If idioventricular, then it is originating near the left posterior fascicle, which then mimics RBBB + LAFB. --In any case, there is ST elevation in I and aVL (high lateral MI) with reciprocal STD in inferior leads. There is also ST elevation in V2 and V4-V6. Left Main occlusion results in an ECG with overlapping syndromes of proximal LAD occlusion (STE in V1-V6, I, aVL) and circumflex occlusion (lateral STE and posterior STEMI, which has ST depression in V1-V4, which may diminish the ST elevation of the anterior STEMI. Below is the clearest discussion of Lead aVR in ACS that you will find. The following article on aVR in ACS is taken from an article I wrote last year. Full text is available here. This excerpt is reprinted from Smith SW. Updates on the Electrocardiogram in Acute Coronary Syndromes. Current Emergency and Hospital Medicine Reports 2013; 1(1): 43-52. 1. Lead aVR in Acute Coronary Syndromes. It is important to note that when I use the term "left main disease" I do not refer to occlusion but to insufficiency; that is, enough obstruction to cause ischemia, but not fully occluded. There is a body of literature in the past decade on the significance of ST-segment elevation in lead aVR in ACS, and especially for its significance for diagnosis of left main coronary artery (LMCA) obstruction and 3-vessel disease.63-68 The literature is confusing for a few reasons. First, studies do not always clearly distinguish patients with and without STEMI. Second, LMCA “obstruction” is rarely defined, leaving it ambiguous as to whether the obstruction is 1) complete, 2) incomplete (subtotal), 3) complete but with good collateral circulation or 4) intermittent. Third, the studies were nearly all small with a retrospectively identified group with LMCA ACS. Fourth, findings may be influence by individual anatomy, ischemic preconditioning, and the timing of ECG recording. Since patients with LMCA occlusion do not often survive to the cath lab, the pretest probability for any positive ECG findings is low, and any reported sensitivities and specificities may distort the clinician’s assessment of the actual presence of disease. Lead aVR in STEMI is touted as important for recognizing LMCA occlusion.68 Since patients with STEMI are already identified as a group which needs immediate reperfusion therapy, the primary importance of recognizing LMCA involvement in STEMI is 1) to recognize the increased mortality associated with this finding and 2) in the potential to avoid thienopyridine (e.g., clopidogrel) administration in such patients who are likely to need CABG and may suffer from excessive bleeding if they do receive a thienopyridine. Lead aVR has been ignored in the past because it is 180° opposite from an imaginary lead between leads I and II, and therefore would provide no independent data. More recent claims that ST elevation in aVR is independent of ST depression in these opposing leads have not been substantiated for Non-STEMI, though this appears to be true for STEMI (see above). Nevertheless, it is convenient to use one lead with ST elevation (aVR) as a substitute for many others with ST depression, such that, in Non-STE-ACS, the degree of ST elevation in aVR correlates with the number of leads with ST depression, the depth of the ST depression, and the sum of ST depressions.67, 73-76 In all studies, measurements of the ST segment are at 80 ms after the J-point for ST depression and 20 ms after the J-point for ST elevation, both relative to the TP segment. To very briefly summarize the literature, diffuse ST depression has a good PPV and NPV for 3-vessel and left main disease (not occlusion! ).73, 77 The degree of STE in aVR, though not independent of ST depression, has strong association with outcome independent of clinical factors such as Killip class and blood pressure.74, 76 Barrabes et al. studied 775 Non-STEMIs and found that, compared to no STE in aVR, STE of 0.5 to 1.0 mm had odds ratio (OR) for death of 4.2 (1.5 - 12.2), and STE of ≥ 1.0 mm had OR of 6.6 (2.5 – 17.6).74 There were 475 who underwent angiography; of those with ≥ 1 mm of STE in aVR (n=92), 48% had 3 vessel disease and 18% had LMCA disease, compared to 21% and 4% for those with less than 1 mm STE in aVR.74 Kosuge et al.75 (2005) studied 310 patients with ACS without STE. They found that STE in aVR of ≥ 0.5 mm was the strongest predictor of LMCA or 3-vessel disease, with an OR of 19.7, and it identified LMCA or 3-vessel disease with 78% sensitivity and 86% specificity, and a PPV and NPV of 57% and 95%. Finally, Szymanski et al. in 2008 found mortality correlated with the degree of STE in lead aVR, independent of TIMI score, and was highly associated with ST depression in multiple locations. In 2011, Kosuge et al.67 studied 572 patients with Non-STE-ACS; among the 196 with a positive troponin T on admission, the sensitivity and specificity of STE ≥ 1.0 mm in aVR for LMCA or 3-vessel disease was 80% and 93%, with a PPV of 56% and an NPV of 98%, and accuracy of 92%. OR of degree of STE in aVR for severe 3-vessel or LMCA disease among all patients was 29 (9.5 – 50). CABG was undertaken in 46% of those with severe 3-vessel or LMCA disease vs. 2% of those without. The authors suggest withholding clopidogrel in patients with Non-STEMI and STE in aVR of at least 1 mm. Summary of lead aVR in ACS: Thus, STE in aVR in Non-STEMI, though not independent of ST depression elsewhere, is a good approximation of the sum of STD and is a very useful predictor of poor outcomes and of need for CABG, independent of other clinical data. In Non STE-ACS, STE in aVR is reciprocal to diffuse ST depression, opposite (reciprocal) to a negative ST vector towards I, II, and V5, and is a result of subendocardial ischemia. On the other hand, the STE in aVR in STEMI, usually anterior STEMI, is more likely a result of transmural injury (STEMI of the basal septum). In this latter case the STE in aVR is not reciprocal to any ST depression, but directly indicative of injury. 2) In both STEMI and Non-STEMI, the degree of STE in aVR correlates with worse disease and worse outcomes, independent of the clinical presentation; these patients must be treated aggressively with early angiography and revascularization. 1. Jong, GP et al. Reciprocal Changes in 12-Lead Electrocardiography Can Predict Left Main Coronary Artery Lesion in Patients With Acute Myocardial Infarction. International Heart Journal 47:13-20; 2006. 2. Rokos IC et al. Correlation Between Index Electrocardiographic Patterns and Pre-Intervention Angiographic Findings: Insights From the HORIZONS-AMI Trial. Catheterization and Cardiovascular Interventions 79:1092-1098; 2012. 63. Aygul N, Ozdemir K, Tokac M, et al. Value of lead aVR in predicting acute occlusion of proximal left anterior descending coronary artery and in-hospital outcome in ST-elevation myocardial infarction: an electrocardiographic predictor of poor prognosis. J Electrocardiol 2008;41(4):335-41. 64. Kotoku M, Tamura A, Abe Y, Kadota J. Determinants of ST-segment level in lead aVR in anterior wall acute myocardial infarction with ST-segment elevation. J Electrocardiol 2009;42(2):112-7. 65. Nikus KC, Eskola MJ. Electrocardiogram patterns in acute left main coronary artery occlusion. J Electrocardiol 2008;41(6):626-9. 66. Wong CK, Gao W, Stewart RA, French JK, Aylward PE, White HD. The prognostic meaning of the full spectrum of aVR ST-segment changes in acute myocardial infarction. Eur Heart J 2012;33(3):384-92. 67. Kosuge M, Ebina T, Hibi K, et al. An early and simple predictor of severe left main and/or three-vessel disease in patients with non-ST-segment elevation acute coronary syndrome. Am J Cardiol 2011;107(4):495-500. 69. Zoghbi GJ, Misra VK, Brott BC, et al. ST Elevation Myocardial Infarction due to Left Main Culprit Lesions: Percutaneous Coronary Intervention Outcomes (abstract) In: Journal of the American College of Cardiology; 2010 March 9; Georgia; 2010. p. E1712. 70. Kurisu S, Inoue I, Kawagoe T, et al. Electrocardiographic features in patients with acute myocardial infarction associated with left main coronary artery occlusion. Heart 2004;90(9):1059-60. 71. Engelen DJ, Gorgels AP, Cheriex EC, et al. Value of the electrocardiogram in localizing the occlusion site in the left anterior descending coronary artery in acute myocardial infarction. J Am Coll Cardiol 1999;34(2):389-95. 72. Yamaji H, Iwasaki K, Kusachi S, et al. Prediction of acute left main coronary artery obstruction by 12-lead electrocardiography. ST segment elevation in lead aVR with less ST segment elevation in lead V(1). J Am Coll Cardiol 2001;38(5):1348-54. 73. Gorgels AP, Vos MA, Mulleneers R, de Zwaan C, Bar FW, Wellens HJ. Value of the electrocardiogram in diagnosing the number of severely narrowed coronary arteries in rest angina pectoris. Am J Cardiol 1993;72(14):999-1003. 74. Barrabes JA, Figueras J, Moure C, Cortadellas J, Soler-Soler J. Prognostic value of lead aVR in patients with a first non-ST-segment elevation acute myocardial infarction. Circulation 2003;108(7):814-9. 75. Kosuge M, Kimura K, Ishikawa T, et al. Predictors of left main or three-vessel disease in patients who have acute coronary syndromes with non-ST-segment elevation. Am J Cardiol 2005;95(11):1366-9. 76. Szymanski FM, Grabowski M, Filipiak KJ, Karpinski G, Opolski G. Admission ST-segment elevation in lead aVR as the factor improving complex risk stratification in acute coronary syndromes. Am J Emerg Med 2008;26(4):408-12. 77. Barrabes JA, Figueras J, Moure C, Cortadellas J, Soler-Soler J. Prognostic significance of ST segment depression in lateral leads I, aVL, V5 and V6 on the admission electrocardiogram in patients with a first acute myocardial infarction without ST segment elevation. J Am Coll Cardiol 2000;35(7):1813-9. In Non STE ACS, the negative ST vector of subendocardial ischemia points towards leads I,II and V5. Can you please comment on the significance, if any, of concurrent ST elevation in lead III? Does this confound the findings of Non STE ACS, or is this a normal finding in Non STE ACS? Of course there is no rule that says you cannot have multiple types of ischemia simultaneously. In fact, co-culprits are pretty common, and there are theories out there that systemic inflammation can trigger double ACS all at once. Diffuse ST depression with STE in aVR is typical of left main insufficiency, 3 vessel insufficiency and occasionally also just LAD insufficiency. Anyone with 3 vessel disease and ACS may have one of those 3 vessels occlude. Thus, you can have 3 vessel disease and inferior STEMI both at once. Cool case. Check it out!! Just to be clear, I take it you're talking about those cases where we see the ST-elevation vector pointed towards the base of the heart: rightward, upward, and a bit posterior (essentially towards the right shoulder). It seems like clear-cut subendocardial ischemia, but then you also notice elevation in lead III and worry that you could be mis-classifying a true STEMI. The first thing to consider is frontal plane angle of the ST-vector we're talking about. With plain subendocardial ischemia (SEI), (in my experience) it tends to run anywhere from 190 to 240 degrees (another digression, I always think in terms of ST-elevation vectors to avoid the confusion of switching between elevation and depression). In an ideal world, the ST-vector would always be 210 degrees (towards aVR), and thus perpendicular to lead III. Things are never that easy, so when you see SEI with an ST-vector of 190 or 200 degrees, you'll expect to also see elevation in lead III since the vector is now angled slightly towards that lead. Likewise, you can also see a little depression in III when the angle of the ST-vector is higher towards 220 or 230 degrees. So, this elevation in III can be "normal" and expected. As Dr. Smith alluded to though, you can also see the same or a very similar pattern with double-culprit ACS. Sometimes the vector will be a bit off from our expectations (in his linked case it's more like 180 degrees in the frontal plane), but sometimes there won't even be a hint. This sounds like a destined-to-lose scenario, but we do have a way out. As Dr. Smith also discussed, refractory ischemia in the setting of SEI is a ticket to the cath lab. If you have do encounter co-culprit ACS, one of two things will happen: you will either be unable to relieve the ischemia medically (patient goes to cath) or the ischemia will resolve (patient can wait a bit for cath). It's one of those situations where managing things clinically is infinitely simpler than trying to tease out a diagnosis that's not even needed to guide treatment. I've also seen this pattern of SEI combined with old inferior STEMI with ventricular aneurysm (causing persistent inferior ST-elevation), and in that case the ST-vector was well below 180 degrees - really mimicking acute inferior STEMI. The only saving grace there would be old EKG, clinical suspicion, and echo. Thank you so much for this post! I've been meaning to put together a discussion like this for a while, but it's much better that I can just refer folks to your expert opinions since the cries of "STEMI equivalent!!" and "LMCA occlusion!!" can be tough to deflect without a lot of weight behind the writing. you said " Left Main occlusion results in an ECG with overlapping syndromes of proximal LAD occlusion (STE in V1-V6, I, aVL) and circumflex occlusion (lateral STE and posterior STEMI, which has ST depression in V1-V4, which may diminish the ST elevation of the anterior STEMI"
That would apply to right dominant (85-90%).